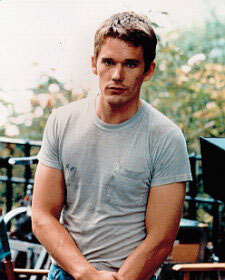 Ethan Hawke first appeared on stage when he was 13, in a high school production of St. Joan. He was 14 when he made his first movie, starring opposite River Phoenix in Explorers, about teen boys in outer-space. Four years later, he had his first mainstream exposure as a fragile boy in Dead Poets Society. His films are usually as serious as Hawke himself, including Alive: The Miracle of the Andes, Before Sunrise and Before Sunset, Gattaca, Snow Falling on Cedars, Training Day, and 2000's high-rise corporate-backstabbing Hamlet. He directed the starving-artist mood piece Chelsea Walls. Reality Bites was a rarity, a Hawke film that could arguably be called a comedy. Hawke's five-year marriage to Uma Thurman collapsed in 2003, as both he and she apparently had concurrent affairs. Hawke frolicked with a Montreal woman, Jennifer Perzow, as he was in Canada filming Taking Lives, while Thurman was taking direction from Kill Bill's Quentin Tarantino. In 2008 he married Ryan Shawhughes, who had been the family's nanny.